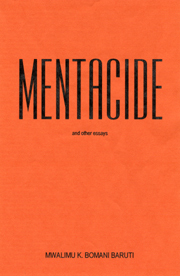 Mentacide and other essays Mentacide occurs when you willingly think and act out of someone else’s interpretation of reality to their benefit and against your survival. It is a state of subtle insanity which, over the last few hundred years, has come to characterize more and more Afrikans globally. This collection of essays addresses various aspects of this self-negating confusion. For we, as an Afrikan people, cannot possibly attain an independent, self-sustaining empowerment without a clear understanding of who we are and are not. We cannot be someone else and ourselves at the same time, especially when that someone else is hell-bent on destroying us. For that reason, a number of these essays look into this confusion by critiquing our refusal to accept responsibility for consciously rearing our children, the political treason of some of the intellectuals who still pretend to speak for us, the flight of our emotions from european faiths to Afrikan spiritual systems designed to cater to our unchanged european ways and the systematic incarceration of our men and women and boys and girls. Still, nearly half bring solutions to the table by paying homage to the thought and behavior of revolutionary ancestors and elders, discussing the responsibilities that our daughters and sons must be taught and internalize in preparation for their adult duties and examining the mental and physical conditions that are essential to our independent empowerment as a people. As we know, problems and solutions work hand in hand. Without knowing something is wrong or, if aware, why what is wrong is wrong, we cannot implement ideas or programs that will help us solve our problems to our advantage. To that end, this book is an Afrikan centered investigation into both some of our problems and potential solutions to those problems.